The new Bengaluru International Airport commenced operations on 24th May and I was lucky to fly in to the city a few days later to experience this international gateway in South India. A quick summary of my experience. 53 check-in counters means no long queues. No baggage screening to be done by passenger. It all happens after check-in by the airport/airline staff. Good refreshment outlets at the Food Court (there is Barista and Taste of India serving south & north Indian dishes) and shopping area (Shopper’s Stop, Tommy Hilfiger) after security check-in. There is free Wi-Fi but I didn’t get a chance to try it. No traffic discipline at the drop-off area. And of course we Indian drivers just don’t seem to respect a “Zebra Crossing”. It’s a long drive away from the city and Bangalore traffic they say can be really bad in peak time. 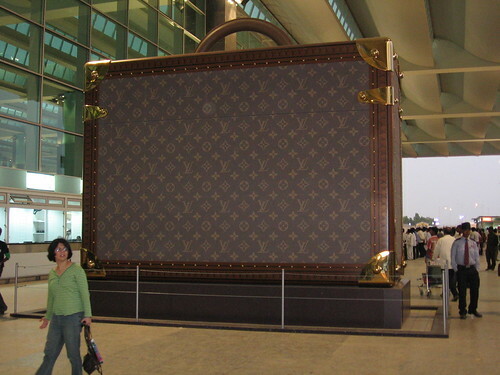 This is a huge replica of a Louis Vuitton bag outside the Departure area of the airport. Next week I should be flying to Hyderabad and will get a chance to see the new airport there too.